Partick Thistle progressed to the last 16 of the Scottish Cup courtesy of a well deserved win over St Mirren. The Premiership visitors were totally in command until a late wobble when Keith Watson forced the ball home. Danny Seaborne shot the Jags ahead on 62 minutes when the ball fell to the defender from a corner. Thistle's second goal came from another corner, with David Amoo converting after Jamie Langfield had saved a Kris Doolan overhead kick. It was a fifth win in seven outings for Alan Archibald's side, with the only loss in that sequence coming at champions Celtic. The other consistent factor was the quality of the Paisley pitch which coped well with the snow and looked pristine, if with added zip. Is there a better playing surface in all the land? Thistle tried to prove the point with slick passing but the first real opportunity took 20 minutes to arrive. Stuart Bannigan and Stevie Lawless combined on the break to set up Doolan, who came sliding in and should really have scored, but already we were getting a sense of things to come. Even the missed chance was costly for Saints. Midfielder Stuart Carswell was injured attempting to halt it and although he managed to play on for a few moments, he had to be replaced by youngster Jordan Stewart. That triggered a St Mirren reshuffle and Thistle went on to dominate the first half, with Lawrence Shankland dreadfully isolated up front and the Paisley back line under siege. Amoo sizzled in a shot which Langfield just about dealt and the score was somehow blank at the interval. There was another alteration in the Buddies' shape at the break but not much changed in the second half. Thistle continued to threaten and Doolan and Amoo both went close again. A goal was coming and it arrived when Seaborne got on the end of a Bannigan corner kick on the left, which was knocked down by a Saints head. The defender was given too much time and space and drove the ball beyond Langfield, although the keeper did get a hand on it. Ten minutes later the visitors made it two, from another corner. Doolan met Bannigan's delivery with a spectacular bicycle kick which rattled the crossbar after a touch from the keeper, and Amoo was there to bundle the rebound over the line. Saints rallied late on and Watson scrambled an 88th minute goal after a couple of late chances, one of which brought a miraculous save from Thomas Cerny. The match was labelled First foot Friday, with fans of both teams encouraged to sit together inside the stadium. The Maryhill faithful enjoyed the party but the hangover had already bitten on St Mirren. Match ends, St. Mirren 1, Partick Thistle 2. Second Half ends, St. Mirren 1, Partick Thistle 2. Andy Webster (St. Mirren) wins a free kick in the attacking half. Foul by Sean Welsh (Partick Thistle). Goal! St. Mirren 1, Partick Thistle 2. Keith Watson (St. Mirren) right footed shot from the centre of the box to the high centre of the goal following a corner. Corner, St. Mirren. Conceded by Liam Lindsay. Corner, St. Mirren. Conceded by Tomás Cerny. Attempt saved. Calum Gallagher (St. Mirren) right footed shot from the centre of the box is saved in the top left corner. Corner, St. Mirren. Conceded by Danny Seaborne. Attempt blocked. Lawrence Shankland (St. Mirren) right footed shot from the centre of the box is blocked. Attempt blocked. Scott Agnew (St. Mirren) right footed shot from the centre of the box is blocked. Substitution, Partick Thistle. Kevin Nisbet replaces Kris Doolan. Abdul Osman (Partick Thistle) is shown the yellow card for a bad foul. Stephen Mallan (St. Mirren) wins a free kick in the attacking half. Foul by Abdul Osman (Partick Thistle). Stephen Mallan (St. Mirren) is shown the yellow card for a bad foul. Foul by Stephen Mallan (St. Mirren). Sean Welsh (Partick Thistle) wins a free kick in the attacking half. Keith Watson (St. Mirren) wins a free kick on the left wing. Foul by David Amoo (Partick Thistle). Attempt missed. Calum Gallagher (St. Mirren) right footed shot from the right side of the box is high and wide to the left. Foul by Kris Doolan (Partick Thistle). Corner, St. Mirren. Conceded by Abdul Osman. Substitution, St. Mirren. Steven Thompson replaces Cameron Howieson. Goal! St. Mirren 0, Partick Thistle 2. 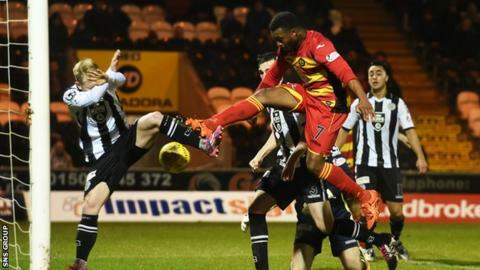 David Amoo (Partick Thistle) right footed shot from the centre of the box to the centre of the goal. Kris Doolan (Partick Thistle) hits the bar with a left footed shot from a difficult angle on the right. Corner, Partick Thistle. Conceded by Calum Gallagher. Attempt missed. Danny Seaborne (Partick Thistle) header from the centre of the box misses to the right following a corner. Corner, Partick Thistle. Conceded by Andy Webster. Attempt saved. Liam Lindsay (Partick Thistle) header from the centre of the box is saved in the centre of the goal. Goal! St. Mirren 0, Partick Thistle 1. Danny Seaborne (Partick Thistle) left footed shot from the centre of the box to the centre of the goal following a corner. Corner, Partick Thistle. Conceded by Keith Watson. Attempt blocked. David Amoo (Partick Thistle) right footed shot from the left side of the box is blocked. Lawrence Shankland (St. Mirren) wins a free kick in the defensive half. Foul by Liam Lindsay (Partick Thistle).